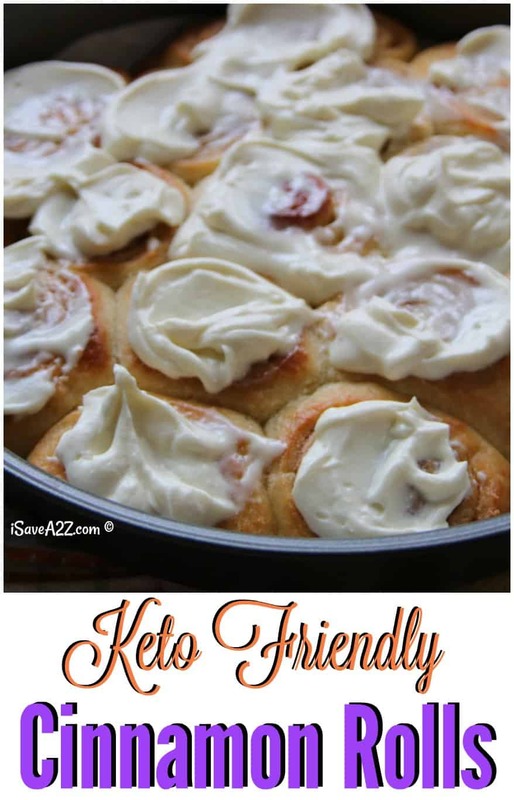 I just made the best Keto Cinnamon Rolls Recipe that fits my Low Carb lifestyle and is made with Cream Cheese Frosting! I am in heaven! Day by day I am realizing that there are many ways to incorporate treats into my Ketogenic diet way of life. I’ve been “eating keto” since January! I feel less bloated, lost weight and feel amazing! I don’t see me changing this way, ever! 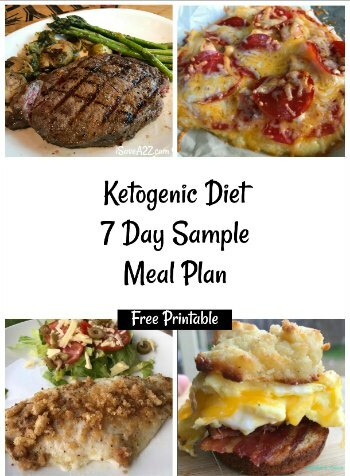 If you want to know more about the Ketogenic Diet, read this article on The Simple Way to Start the Ketogenic Diet. It gives a good explanation about how the diet works and everything you need to know to get started. It even has a printable foods list. Kicking the sugar habit was horrible for me. 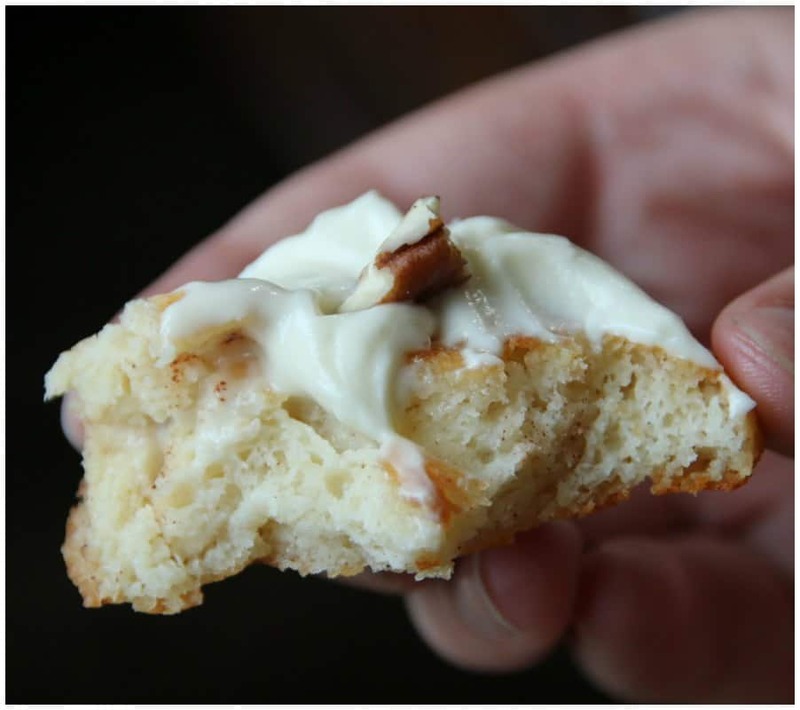 I am so happy to be able to make rare treats such as these Keto Cinnamon Rolls when I want something different. Oh! Wanna know the best part? 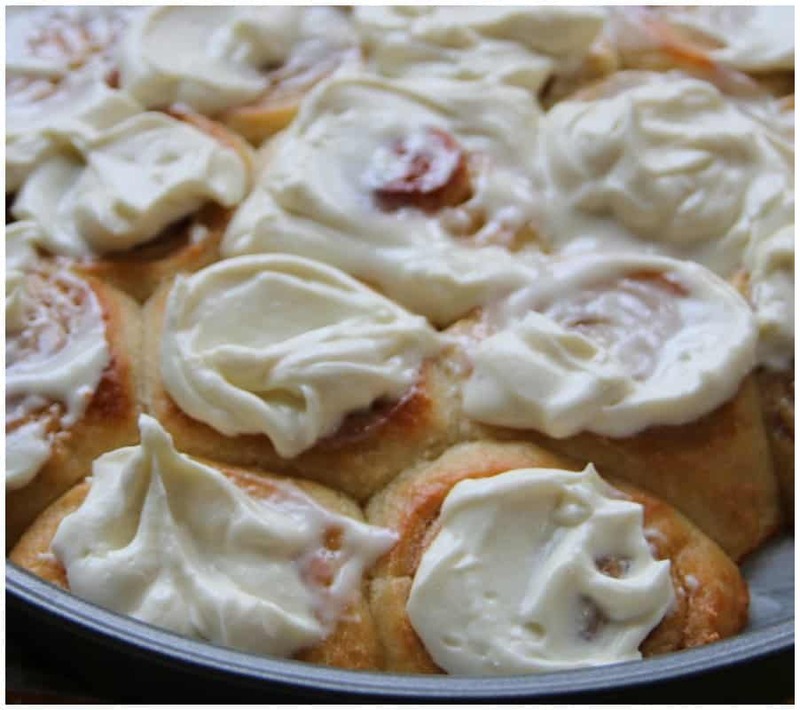 You don’t have to use yeast or wait for the cinnamon rolls to rise! You can whip up this dough in under 10 minutes! And don’t be put off by these low carb ingredients either. You cannot tell that they are made with cheese when you bit into the finished dessert. Seriously. They are delicious! This is made very similar to the Low Carb Pizza Dough Recipe we have. I get asked all the time, what can I have for dessert and this is the recipe I tell people about most often. The second question I get asked is… what snacks do you have? 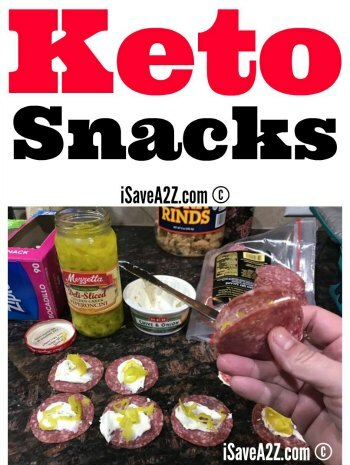 I think my most favorite snack is a piece of salami rolled up with a layer of cream cheese and a pickle served in the center but another snack I make often are these Low Carb Cheese Crackers! People are amazed at how many food options you have while sticking to Keto! Get the printable version of this recipe at the very bottom of this post. Optional: you can add a 1/4 teaspoon of vanilla to add more flavor. I love vanilla! After the cheese has melted, add one egg, Almond Flour, and Baking Powder. Save the cinnamon and stevia to sprinkle on the dough after you roll it out. Carefully stir the ingredients until all is well combined and smooth. This will cool down the dough a bit too. The dough will be extremely sticky at this point. Next, dump the dough onto a sheet of parchment paper and begin to knead the dough until all the ingredients are fully mixed in. The dough will be really sticky until you knead it together. You can sprinkle a little bit of almond or coconut flour on the dough to roll it out and prevent sticking too. 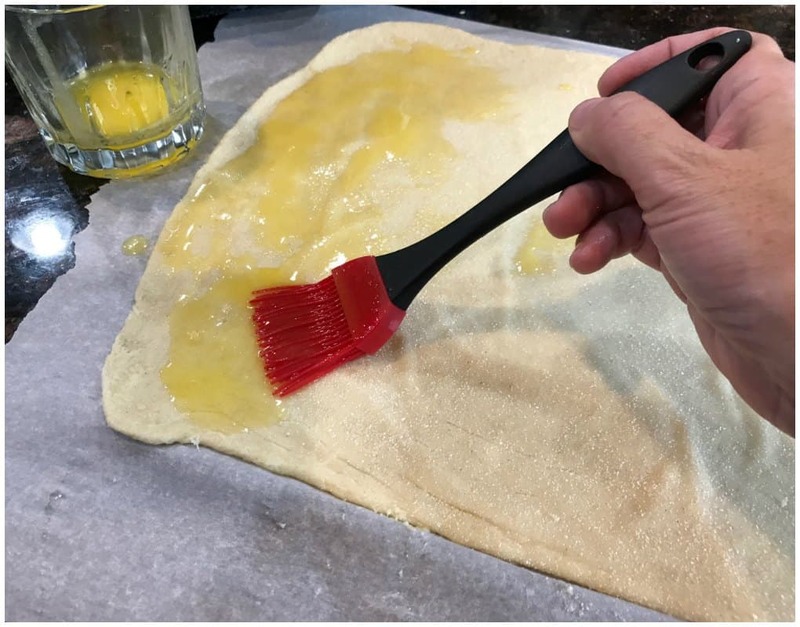 Use a rolling pin to smooth out the dough into a large rectangle shape. 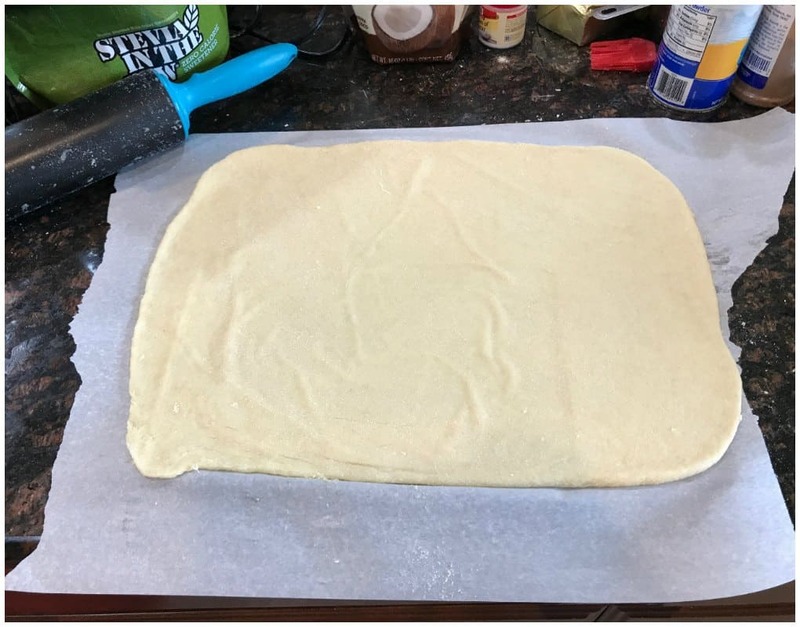 I roll this dough out in between two sheets of parchment paper or a silicone mat with a piece of parchment paper on top of it. Melt the 1/8 stick of butter and spread it sparingly over the rolled out dough. 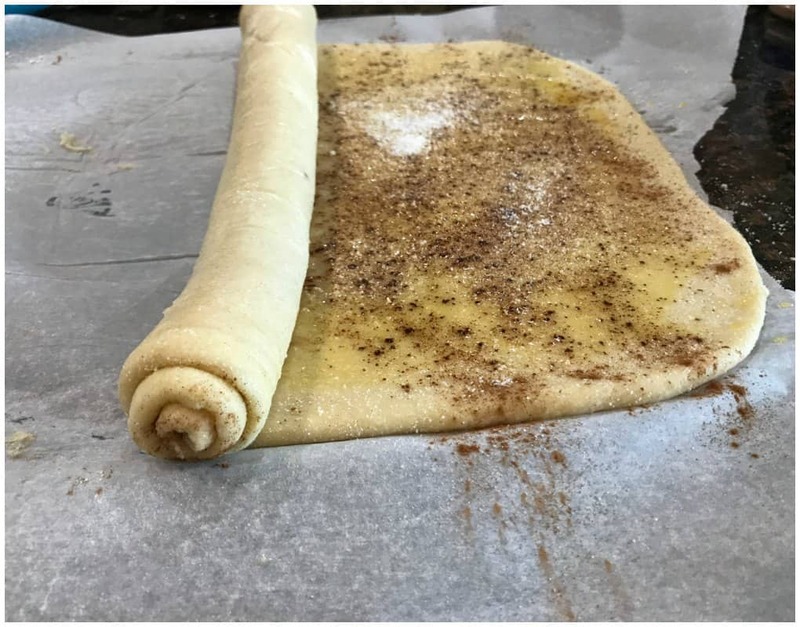 Sprinkle cinnamon and Stevia sweetener onto the dough. Roll up the dough as seen in the photos. 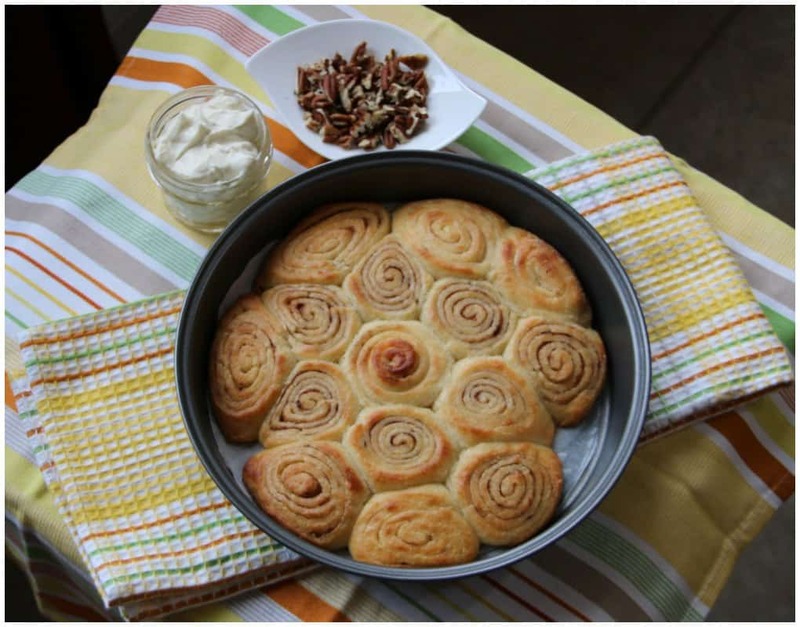 Use a piece of string to cut the dough into 15 different cinnamon rolls. Place a piece of parchment paper in the bottom of your pan to line it before baking. 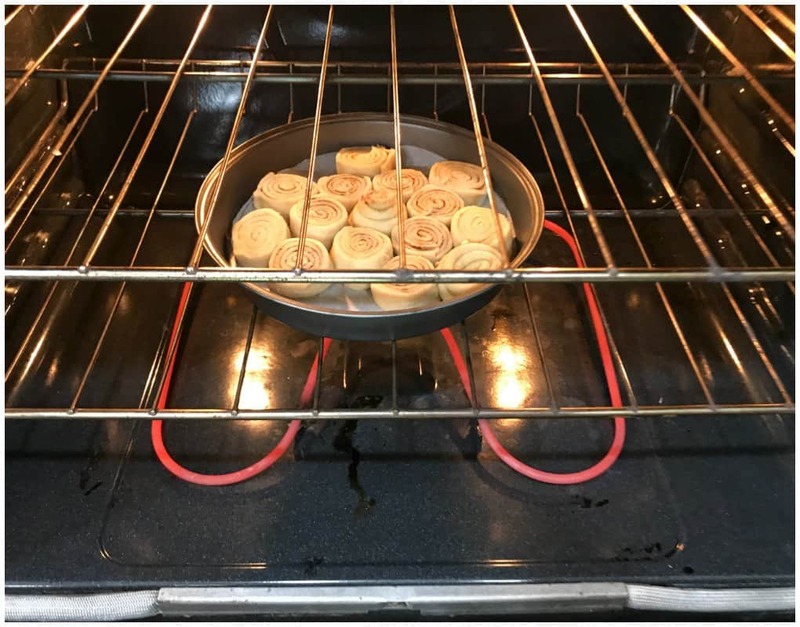 Place the rolls in a baking pan. Set the over to 350 degrees and bake them for about 20 minutes or until golden brown. NOTE: You may have to cook them longer if you cut the rolls thicker. Cook them until they are golden brown and done in the middle. 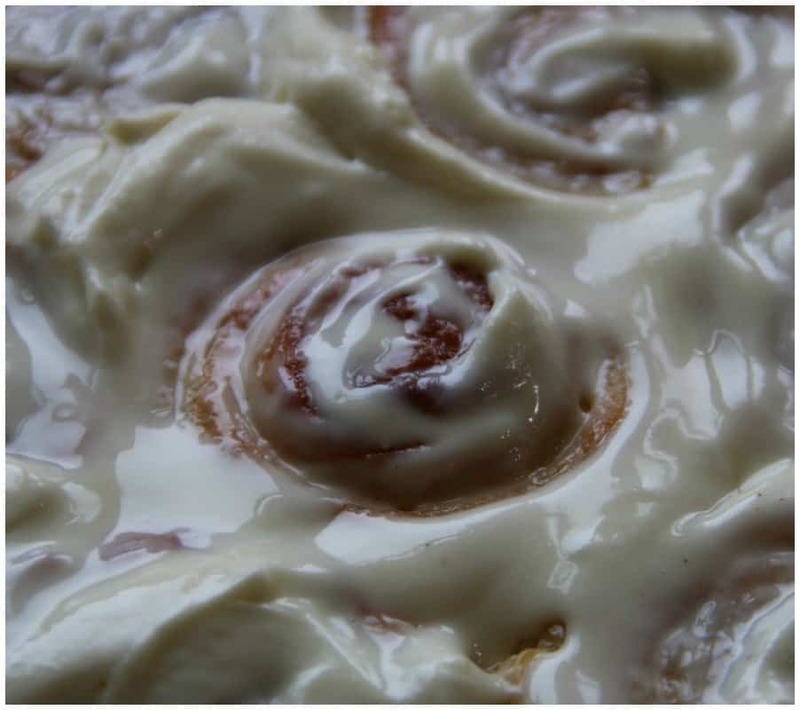 While the cinnamon rolls are baking in the oven, you can begin to mix up the frosting. 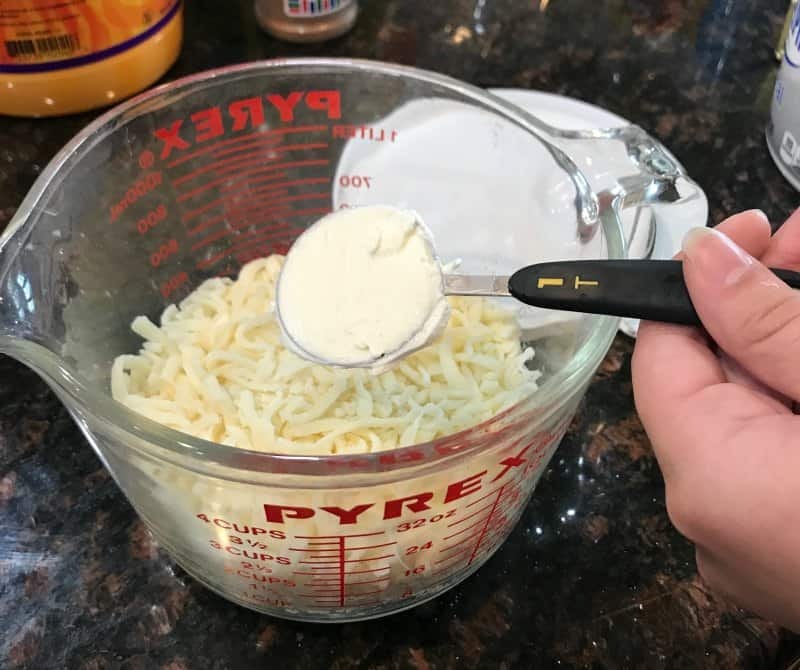 Combine the heavy cream, cream cheese, and powdered sweetener into a bowl and mix it with a mixer on high speed until the ingredients is nice and smooth. 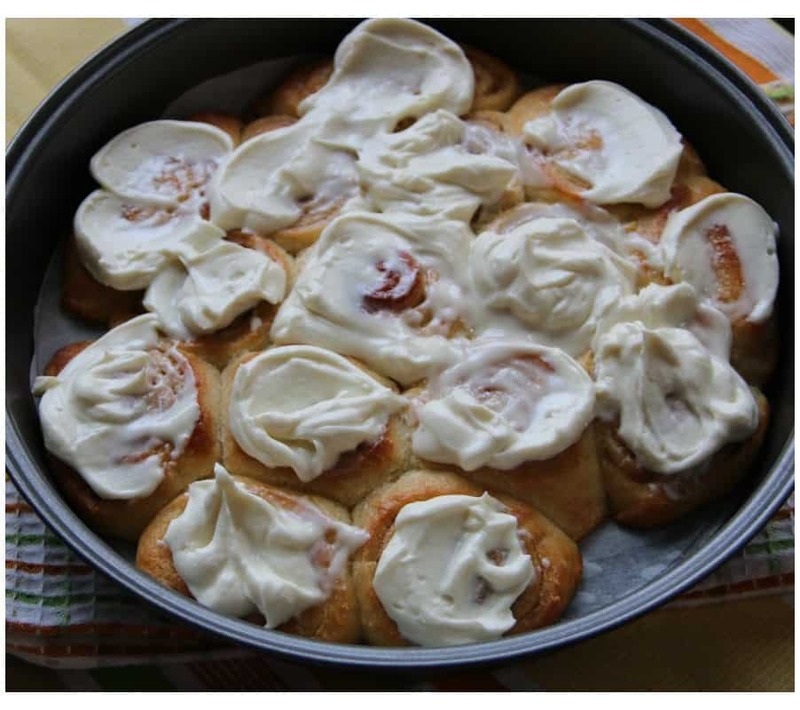 Allow the cinnamon rolls to cool for about 5 or 10 minutes before applying the cream cheese frosting. 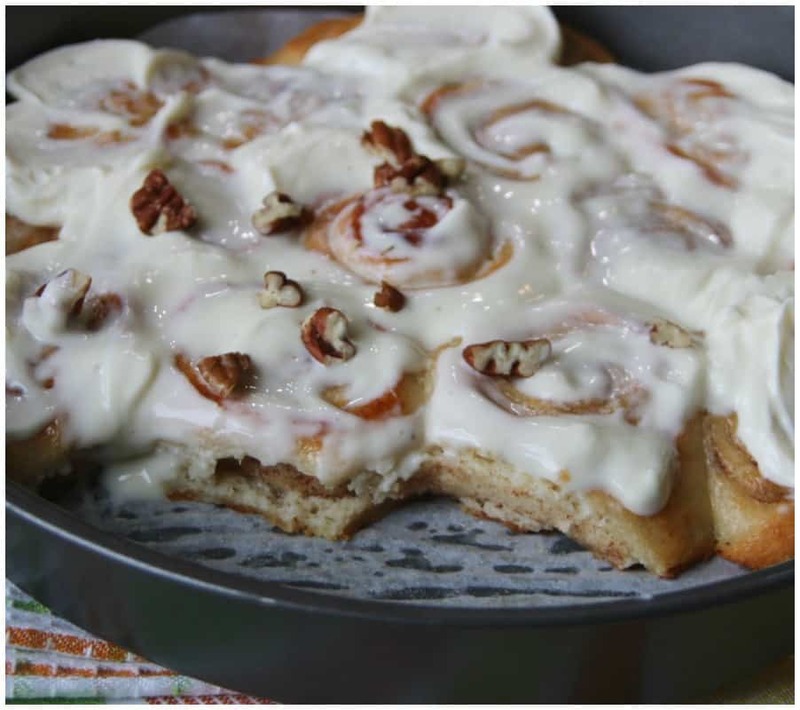 Optional: Feel free to add a few crushed Pecans to the top of your delicious Keto Cinnamon Rolls! YUMMY! 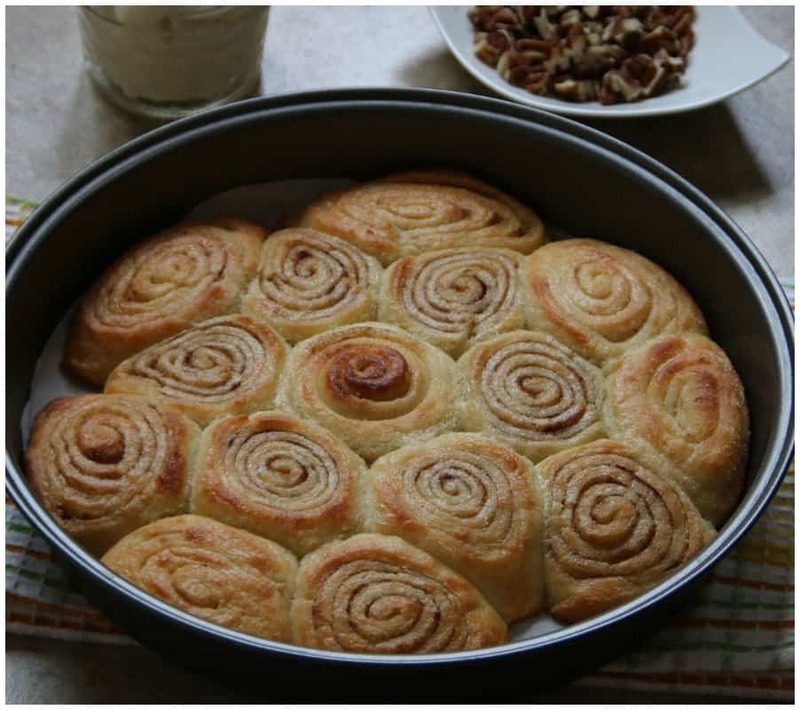 This recipe makes 15 Keto Cinnamon Rolls and it’s just under 4 carbs per serving! Here are the photos we took along the way. Be sure to share this on pinterest too! After all the cheese has melted, carefully stir the ingredients (Almond Flour, Baking Powder, and egg) until all is well combined and smooth. This will cool down the dough a bit too. Dump the dough onto a sheet of parchment paper and begin to knead the dough until the egg is fully mixed in. The dough will be really sticky until you knead it together. You can sprinkle a little bit of almond flour on the dough to roll it out and prevent sticking too. Melt the 1/8 stick of butter and spread it over the rolled out dough. Sprinkle cinnamon and Stevia sweetener on to the dough. Place a piece of parchment paper in the bottom or your pan to line it before baking. Set the over to 350 degrees and bake them for about 10 minutes or until golden brown. 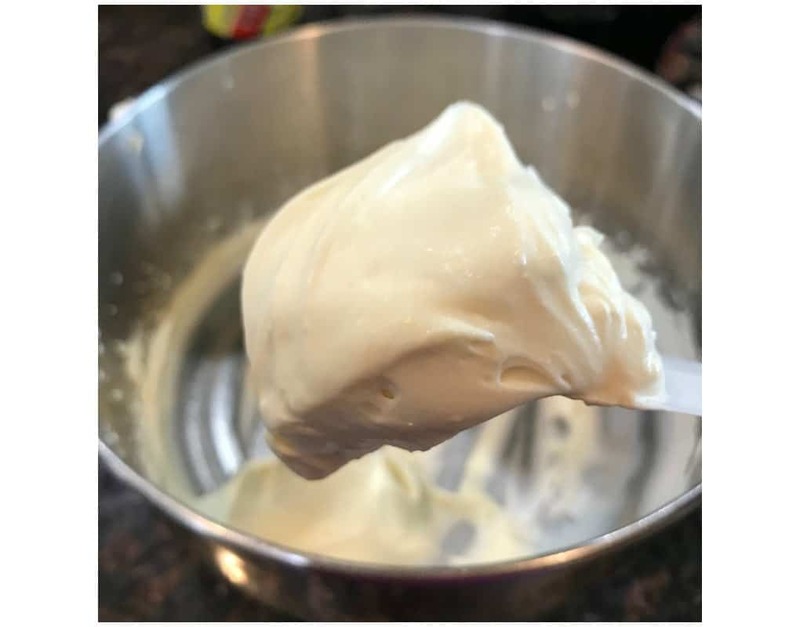 Combine the heavy cream, cream cheese and powdered sweetener into a bowl and mix it with a mixer on high speed until the ingredients is nice and smooth. 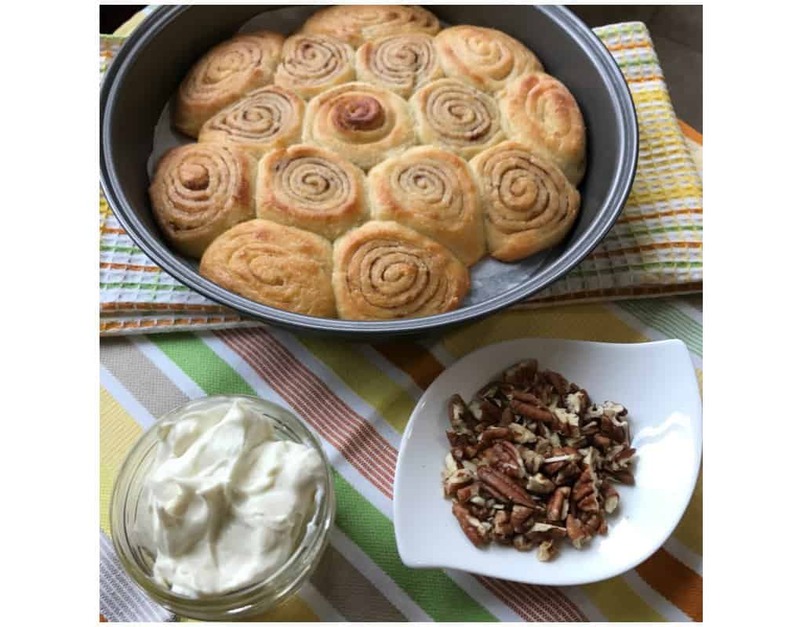 By Jennifer on August 2, 2018 Breakfast, Desserts, Healthy Muffin Recipes, Keto Appetizer Ideas, Keto Dessert Recipes, Keto Friendly Recipes, Keto Thanksgiving Day Recipes, Recipes. Mine didn’t really rise like the pic. The cheese is a different texture, pretty chewy and heavy. They were pretty salty tasting but overall not bad. The frosting is really good. I have never left a comment before but these warrants one! Simply delish! To handle the sticky dough I find it helps to have slightly damp hands. I ended up with 10 small rolls. Will double recipe next time! I went very generous with cinnamon and ‘sugar’ sprinkle – better too much than too little! These were approved by my T1D daughter, her non-T1D friend and my husband! Did a simple frosting just stirring together cream cheese and a pack of Splenda with a dash of vanilla. Oh-em-gee! Thank you! These were just okay. Nothing special. I won’t make this recipe again. The rolls are very small and I was only able to get 12 rolls. 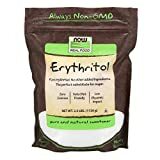 Where can I find the nutrition information. Calories/fat/carbs/net carbs, etc? I don’t see it. Just putting mine in the oven although it looks nothing like yours. Heads up your recipe says in the top part bake 20 minutes, in the summary it says 15 and at the bottom of the recipe it says 10. I will just keep baking until brown but clarifying would help. Thanks! I’m convinced an important step is being left out. 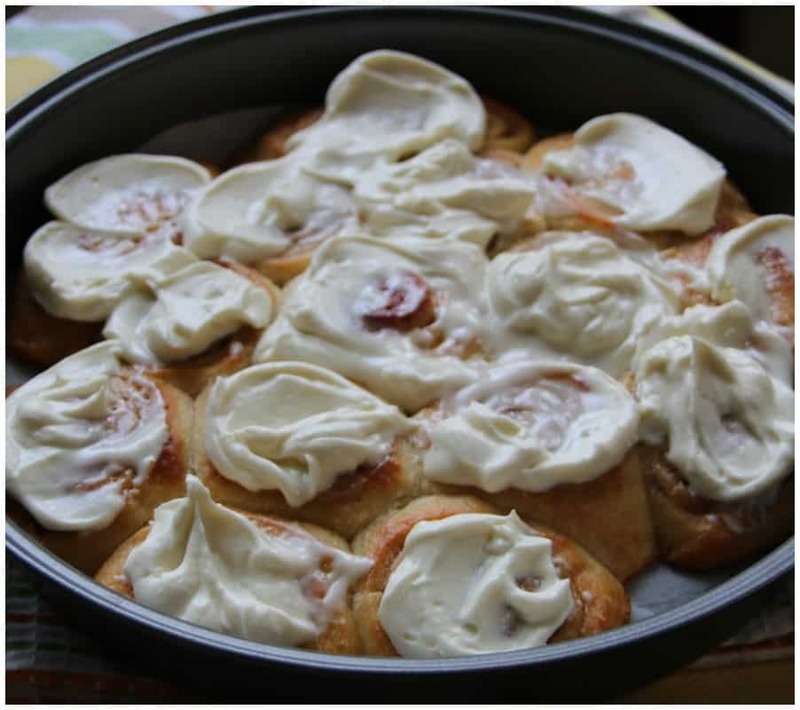 I call these cinnamon roll cookies. 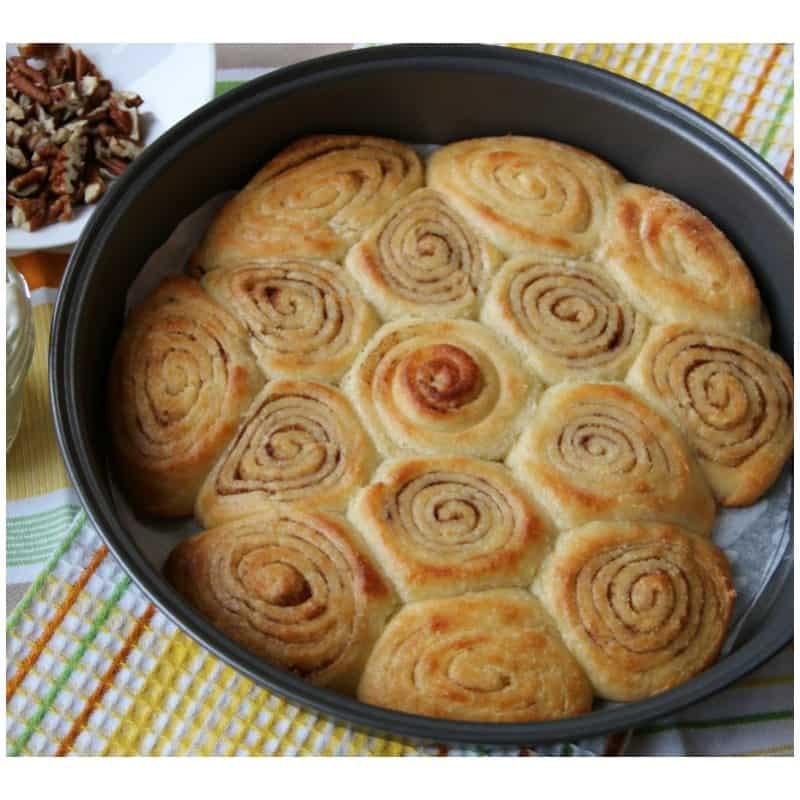 They were still delicious, but not even close to looking like a cinnamon roll. Very sticky dough, will try my kitchenaid mixer to knead. Will also try to put it in the fridge. This is definitely a keeper! Thanks to the person who said she used coconut flour (1/4c. instead of almond). I used that tweak. Since the dough was still sticky after much stirring, I tried to knead it using a bit of almond flour, then, while it was still sticky, I put it in a gallon ziplock bag, threw some powdered swerve on top of it to help keep it from sticking, then zipped it up and rolled the dough to fit the inside of the bag. I put that in the frig for a couple hours. then, I cut the sides of the bag open and used the bag itself to help roll the dough (like using a towel to roll a pumpkin roll). Worked really well. I cut it into 12 good sized rolls. Put them in a square pan on parchment. They are really good! Next batch I will use almond flour for comparison. Thanks for creating this!! 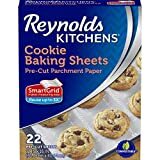 I just made these, and they’re in the oven now, but was able to get only 6 rolls out of the dough. Seems like an awful lot of mozzarella cheese for 6 rolls. Is there a thickness they should be rolled out to? 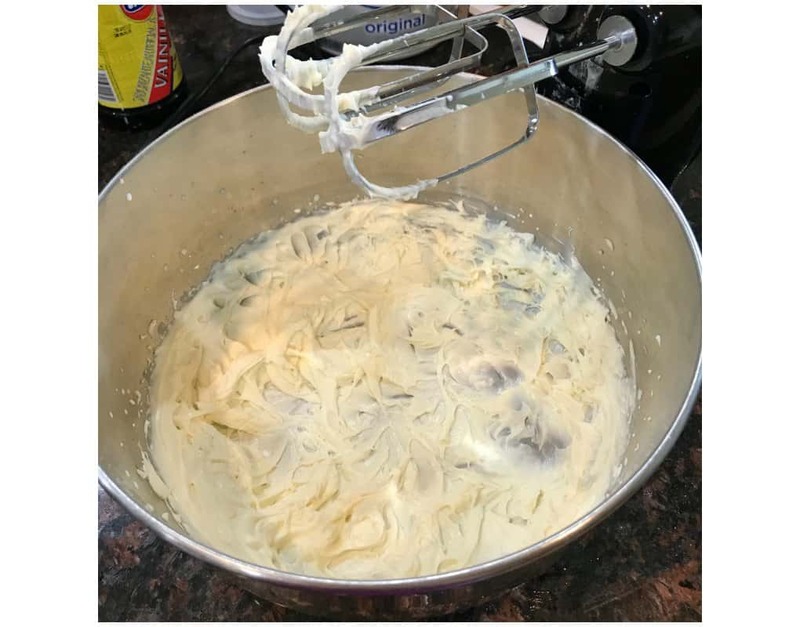 The ingredients list says 1/4 stick butter but the instructions say 1/8 stick. I used the 1/4 and it’s way too much. I’m assuming it should be the 1/8th and that was a typo in the ingredients list? 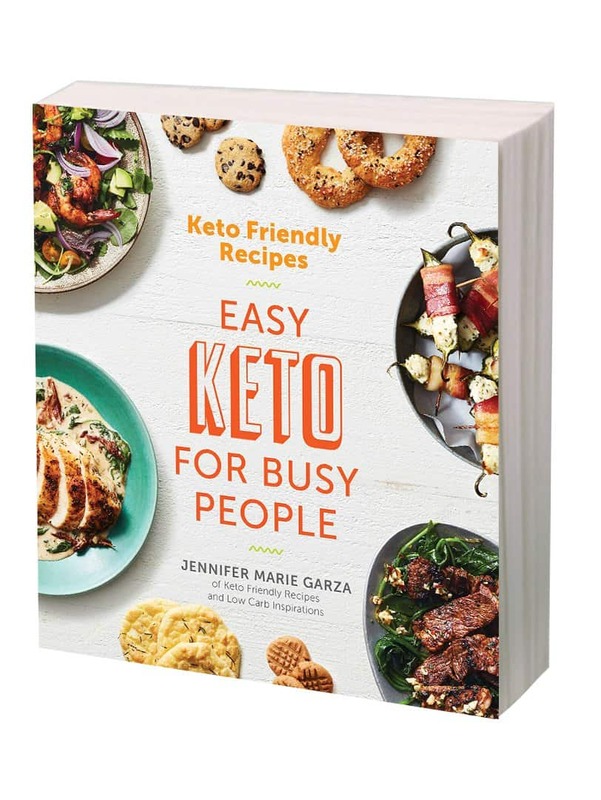 Really love your site and all the info regarding eating the keto way. 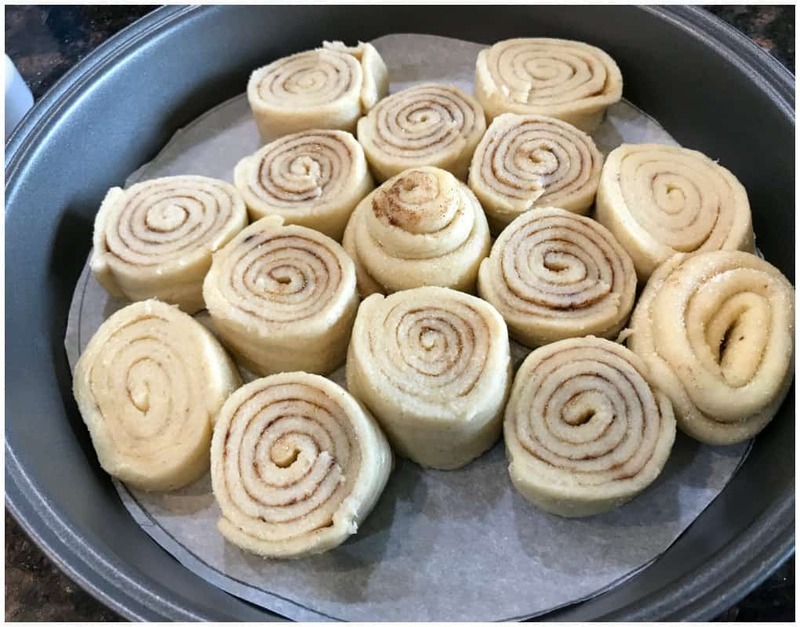 I love cinnamon rolls and wanted a recipe that would make them low carb and yours fits the expectation. I’ve just made the first batch and found dough to be real sticky and lacking in taste, so the next recipe I’ve decided to add Truvia instead. If you look at your recipe, you’ll find that many ingredient items are showing computer code which makes it hard to read. 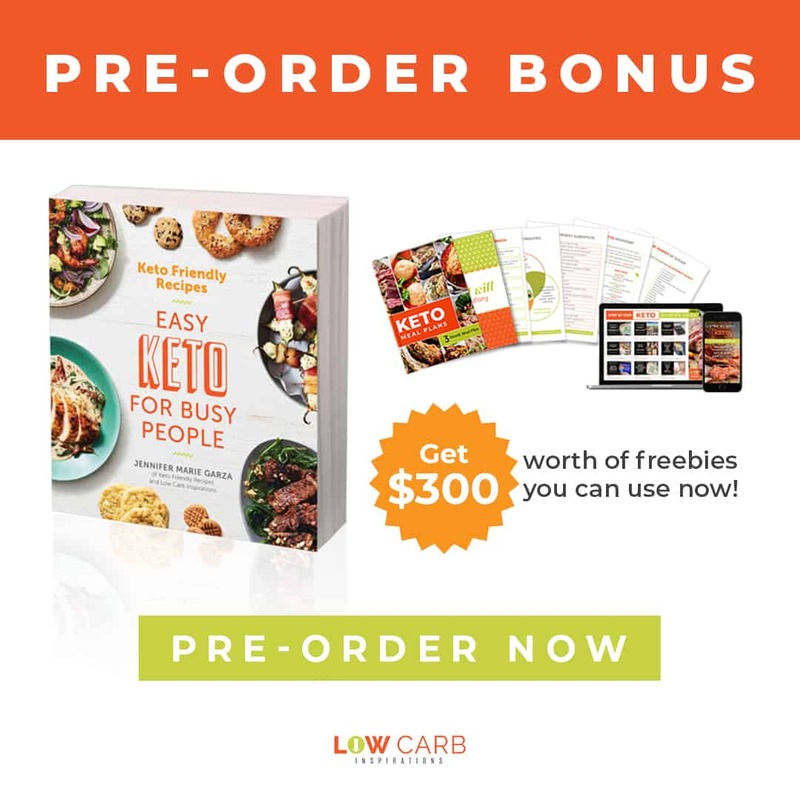 Thanks for all the great information on a dessert that really is low carb and keto friendly. These were great. I don’t think I rolled my dough enough so mine made less rolls and therefore took longer to cook. (about twice an long ) over all they were a success. Probably needed to wait a little longer before icing as it tended to be a little runny and was hard to tell where the rolls broke apart. I just guessed and cut with a knife. Thanks for the recipe. Can coconut flour be subbed for the almond flour? I just made these and used Stevia, I even cut the amount because of the aftertaste. Is there a better sweetener to use that doesn’t have that nasty aftertaste? Any suggestions would be appreciated! BTW – They did take longer to cook than the recipe suggested but overall, I think they looked terrific. I just need to change the sweetener. Yes, there is a much better tasting sweetener than Stevia. I cannot handle the taste of Stevia, either. (The only exception to that is Lilly’s Dark Chocolate Bars and Chocolate Chips. They’re amazing.) Anyway, try Monkfruit or Swerve. Both measure like sugar are fabulous. Before rolling up the dough and slicing it into rolls, I laid strips of raw bacon along the roll. Yum! Can you use Coconut flour instead of Almond? If so, does it change the receipe? Mine came out a little flat but tasted great. I will definitely add more cinnamon and sugar substitute next time. Just made these. Delicious! Not as sweet as a traditional cinnamon roll which was a bit of a let down for my kiddos but more for me and the hubs!! 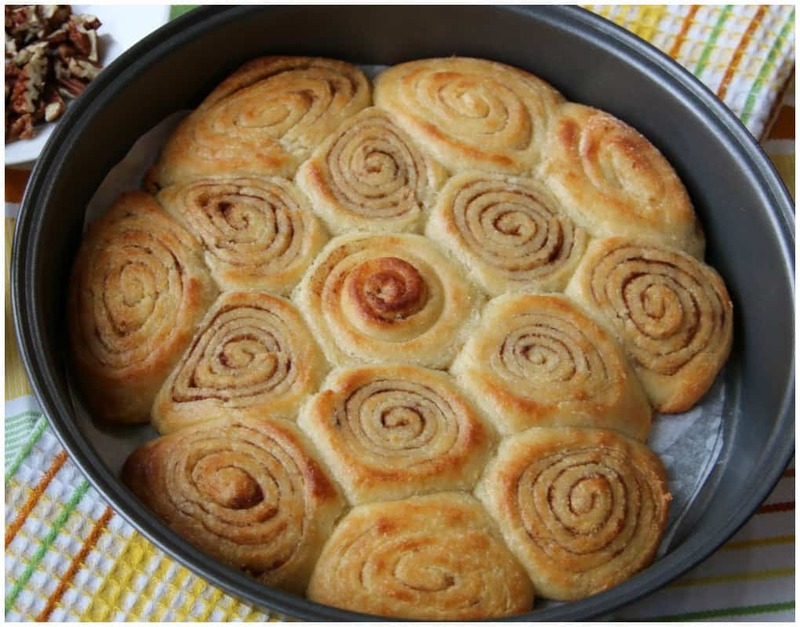 They’re like a cross between a cinnamon roll and a cheese danish. I love them and will definitely make again. Thank you! Amazing that 2 cups of mozzarella cheese is in sweet rolls, usually for savory dishes, but if it works, wonderful! Thanks for the recipe! Super good and satisfying. Many thanks for this recipe. These came out great! I subbed coconut flour for almond flour (1/4 c. And added an extra egg) they came out delicious! Thanks for the recipe! Very very happy with these! I’ve been on Keto for a while now, and normally the the Keto treats are good, but these taste like good ol cinnamon rolls! I rolled my dough thinner so I got a bunch of tiny ones but they came out great!! Mine came out very nice, you do need to bake them longer tho,my only caveat is that they are a little on the sour side any suggestions to modify this? Otherwise very yummie and satisfying! Add 1//2 tsp. Xanthan Gum and 10 min to baking time. Great flavor, and xanthan gum helps hold taller shape. First attempt was a success! 🙂 They are amazing for snack size cinnamon rolls. The cream cheese icing is a lovely touch. I will be using the icing recipe for other desserts. Thank you again for the recipe and the pictures which helped me compare what I am doing to what you have. Tasty! Came out quite nice. Would make again. I did everything per the recipe and mine looked like cookies. My dough looked nothing like yours it was more sticky like a fat head pizza dough. Any thoughts? I’d love to try them again but be successful next time. Mine also came out like cookies. I would cram more of them together next time so they stand up more in the pan. I actually did cram them together. But mine tasted odd. The dough was very sticky and I followed the recipe to the letter. Dont know what happened. Going to try again. You need to knead the dough until it isn’t sticky anymore. Great recipe! I added the cinnamon to the dough as stated in the instructions, not realizing until after that it was meant to go on after rolled out. Still tasted great but would update the recipe not to say add cinnamon to the dough. These turned out perfect. They did take much longer to cook than the recipe says but really tasty. I feel so stunned at how anyone could come up with combining these ingredients to make this tasty treat. Just made these. I had to double the baking time to get golden brown. Delish though! I just updated the recipe with the correct time! Thank you for pointing this out! I had to double the baking time, too. I made the mistake of adding xanthan gum to the frosting. It made it kinda slimy but it was still good. I should have added it to the dough. Great recipe after my first batch was a flub. I apparently did not melt the cheese enough and it became a clingy mess on the parchment paper when I tried to roll it out. Tried again and made sure that the cheese was well melted and it came out in the perfect dough consistency. Great taste, not overly sweet, but the cream cheese frosting is the literal icing on the top. I LOVE that there’s a generous amount on the roll. I have these in the oven now. My dough also is super sticky and couldn’t even really roll it out. Next time I’ll try melt the cheese better! Thanks for tip! No, I sprinkled the cinnamon and sugar on top of the melted butter on the rolled out dough. I misread and mixed mine in. They are in the oven baking so hopefully they still taste okay. Next time I won’t mix them in. Well I used too much butter for my filling and I have puddles under my cinnamon rolls 🙁 I am sure they will still taste good, but we will be eating them with a fork! Thank you for this beautiful recipe…I am sure with more practice I will master it!! hay I cnat find the face about how mine carbs fat exc..?? I did everything per the recipe and mine are taking over twice as long to cook. Hi there! I tried making these tonight but they came out a bit different than yours. They’re not bad, but also not my favorite. I have a more meal like almond flour. Do you think that is what made the difference? Also, is swerve less tangy than stevia for baking? Thank you for this wonderful idea! I look forward to trying again. These look yummy! I want to try it, but I will be using coconut flour since I can’t have almonds. 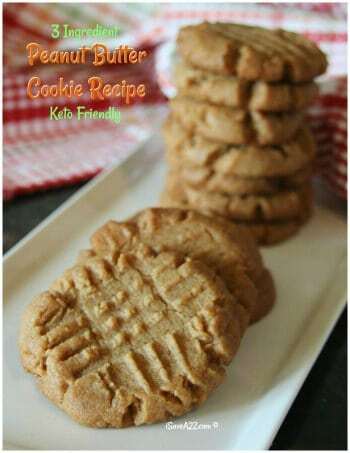 I was just going to try it out first before commenting, but then I checked out another recipe of yours and saw coconut flour so I am wondering if you have tried this recipe with coconut flour? Thanks!